Electrical Control Panel Services at J.B. INDUSTRIES, Ltd.
We offer to build electrical control panels/operator stations to your drawings and specifications, or by combining our Electrical Engineering and Manufacturing Service capabilities, JBI can provide “full service” design/build of your special electrical control requirements. Electrical Controls Design and Documentation. CNC Milling Machine Retrofit (Converted Cincinnati Milacron #10VC from tape drive input to Siemens Model Acramatic™ A2100 CNC computer control). 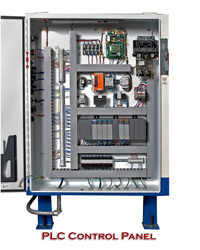 Conversion of existing machine relay panel controls to PLC control. Please refer to our headings for ENGINEERING or CNC MACHINING to see more reference on our capabilities in regard to electrical controls.